Trichorhinophalangeal 1 (Trps1) is a transcription factor essential for epithelial cell morphogenesis during kidney development, but the role of Trps1 in AKI induced by ischemia-reperfusion (I/R) remains unclear. Our study investigated Trps1 expression during kidney repair after acute I/R in rats and explored the molecular mechanisms by which Trps1 promotes renal tubular epithelial cell proliferation. Trps1 expression positively associated with the extent of renal repair after I/R injury. Compared with wild-type rats, rats with knockdown of Trps1 exhibited significantly delayed renal repair in the moderate I/R model, with lower GFR levels and more severe morphologic injury, whereas rats overexpressing Trps1 exhibited significantly accelerated renal repair after severe I/R injury. Additionally, knockdown of Trps1 inhibited and overexpression of Trps1 enhanced the proliferation of renal tubular epithelial cells in rats. Chromatin immunoprecipitation sequencing assays and RT-PCR revealed that Trps1 regulated cAMP–specific 3′,5′-cyclic phosphodiesterase 4D (Pde4d) expression. 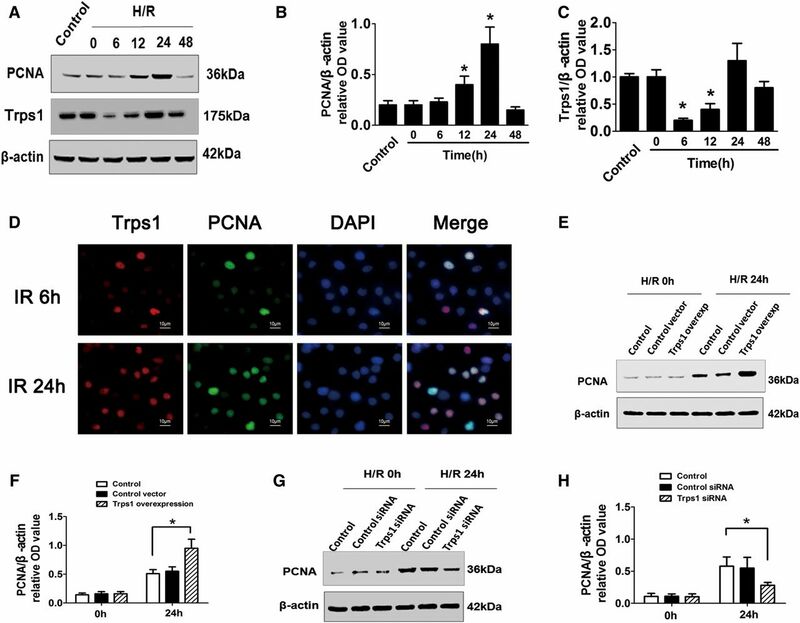 Knockdown of Trps1 decreased the renal protein expression of Pde4d and phosphorylated Akt in rats, and dual luciferase analysis showed that Trps1 directly activated Pde4d transcription. Furthermore, knockdown of Pde4d or treatment with the phosphatidylinositol 3 kinase inhibitor wortmannin significantly inhibited Trps1–induced tubular cell proliferation in vitro. Trps1 may promote tubular cell proliferation through the Pde4d/phosphatidylinositol 3 kinase/AKT signaling pathway, suggesting Trps1 as a potential therapeutic target for kidney repair after I/R injury. Trichorhinophalangeal 1 (Trps1) is an atypical GATA protein that contains three distinct zinc finger domains: C2H2, GATA, and Ikaros. It regulates the transcriptional activation of target genes by binding to their GATA sequences.11 During embryonic development, Trps1 acts downstream of Bmp-7 via the Bmp-7/p38 MAPK/Trps1 pathway to induce mesenchymal to epithelial transition, a process that leads to glomerular and tubule formation.12 Thus, Trps1 is essential for normal nephron formation. Trps1-deficient mice exhibit fewer glomeruli and tubules as well as an expanded renal interstitium in comparison with their wild-type counterparts.12 GATA transcription factors regulate proliferation, differentiation, development, and gene expression in multiple organs.13–15 Trps1 can control Stat-3, Sox9, and several key cell cycle genes to promote cell proliferation by directly binding to the GATA sites in their promoter regions.16–18 It has been reported that Trps1-deficient kidneys manifest a marked decrease in cell proliferation but activate apoptosis.19 However, the role of Trps1 in AKI induced by ischemia-reperfusion (I/R) remains unclear. In this study, we investigated Trps1 expression during kidney repair after acute I/R in rats and explored the molecular mechanisms by which Trps1 promotes renal tubular epithelial cell proliferation. 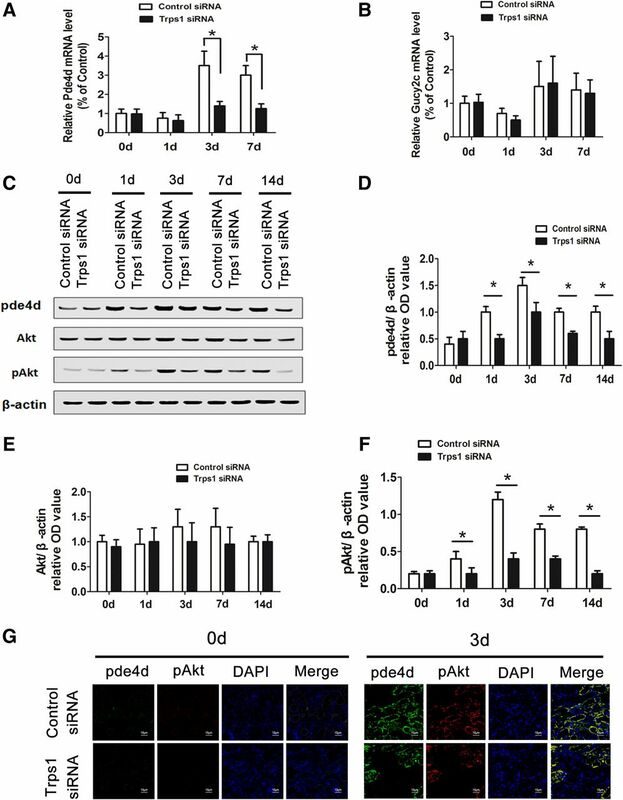 This study, for the first time, provides evidence that Trps1 promotes the proliferation of renal tubular epithelial cells and accelerates renal repair by directly regulating phosphodiesterase 4D (Pde4d) expression at the transcriptional level, suggesting that the Trps1/Pde4d/phosphatidylinositol 3 kinase (PI3K)/AKT signaling pathway plays a critical role in the process of kidney repair after acute I/R injury. In normal renal tissues, Trps1 was expressed in the nucleus and found mainly in cortical tubular epithelial cells. In the moderate I/R injury model, the Trps1 expression level was significantly decreased on the first day after I/R, when more serious damage was observed. On day 3, Trps1 expression was increased as the kidney started to repair itself, and by day 7, Trps1 expression was restored to a level similar to the initial measurement (P>0.05) (Figure 1, A–C). In the severe I/R injury model, the Trps1 level was found to decrease to the minimum on day 3 after I/R, when more serious damage was observed. Then, its expression gradually increased and was restored to a level comparable with the initial level on day 21 (P>0.05) (Figure 1, D–F). The GFR level in the rats showed a consistent trend to that of Trps1. Trps1 expression is positively associated with the extent of renal repair after I/R injury. The rat renal I/R injury model was established by clamping the bilateral renal arteries for 45 minutes (moderate I/R) or 60 minutes (severe I/R) followed by reperfusion. (A) In the moderate I/R model, periodic acid–Schiff (PAS) staining (upper row) and immunohistochemical analysis for Trps1 expression (lower row) in renal tissues were performed at different time points after I/R injury. The relationship between Trps1 (+) cell scores and (B) the severity of renal injury or (C) GFR levels was evaluated. (D) In the severe I/R model, PAS staining (upper row) and immunohistochemical analysis for Trps1 expression (lower row) in renal tissues were performed at different time points after I/R injury. The relationship between Trps1 (+) cell scores and (E) the severity of renal injury or (F) GFR levels was evaluated. Data are expressed as the means±SD for each group of rats (n=6 per group at each time point). *P<0.05 versus Trps1 (+) cell scores of sham controls; #P<0.05 versus GFR levels of sham controls. Renal tubular epithelial cells with a high expression of Trps1 exhibited a normal morphology, and villin was abundantly expressed in the brush border of the renal tubules. On the contrary, podocyte detachment and the bare basement membrane were observed in those renal tubular epithelial cells with a low expression of Trps1, and villin expression was downregulated in the brush border (Figure 2). These results suggested that Trps1 is closely related to the extent of recovery of renal tubular epithelial cells from AKI. Trps1 expression was closely related to the extent of renal tissue repair. (A) Trps1 expression by immunohistochemical staining on day 14 after severe I/R injury. Images were collected using an Olympus DP-72 Microscope. Magnification, ×400. (B) Representative immunofluorescence staining for Trps1 (red) and villin (green) of renal tissues on day 14 after I/R injury. The pathology sections show renal tubules that were poorly repaired (yellow arrows) as well as those that had recovered from AKI (white arrows). To further understand the role of Trps1 in renal repair after AKI, we delivered green fluorescent protein (GFP)-Trps1 or Trps1 siRNA plasmids into the kidneys via a tail vein injection on the basis of an established procedure by applying an ultrasound transducer.20 As shown in Supplemental Figure 1, the Trps1 expression levels were increased by 267% and 154% on days 1 and 14 after Trps1 transfection, respectively (P<0.001 versus control), whereas in rats treated with Trps1-siRNA, the Trps1 expression levels were decreased by 87% and 64%, respectively (P<0.001 versus control), showing that our gene transfection system could effectively increase or inhibit Trps1 expression. In the moderate I/R injury model, Trps1 knockdown by siRNA interference resulted in delayed renal repair as evidenced by higher histologic injury scores. The GFR level in the control animals gradually elevated on day 3 and finally recovered to normal on day 14. Accordingly, Trps1 knockdown rats exhibited significantly lower GFR levels on days 3, 7, and 14 (Figure 3, A–C, Supplemental Figure 2A). Trps1 knockdown by siRNA failed to reach normal on day 14 after I/R compared with controls. In contrast, in the severe I/R injury rats, there was no significant difference in renal function or the severity of renal injury between rats transfected with Trps1 and those transfected with control vector (Figure 3, D–F, Supplemental Figure 2B). However, renal lesions were remarkably improved in the Trps1 overexpression group on day 7 after I/R as shown by the histologic injury scores. In addition, these rats exhibited a significantly higher GFR level on days 7, 14, and 21, and Trps1 overexpression restored the GFR level to normal on day 21, whereas the GFR level in the control animals failed to reach normal on day 21. Masson trichrome staining showed that Trps1 overexpression inhibited the severity of renal fibrosis, whereas Trps1 knockdown by siRNA exacerbated renal fibrosis (Figure 3G). 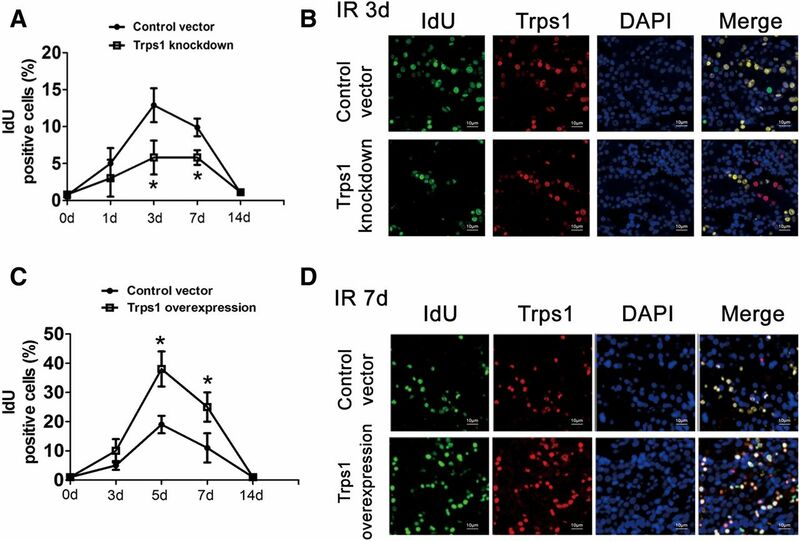 By determining the expression of aquaporin-1(AQP1), we have found that Trps1 overexpression upregulated the expression of AQP1, whereas inhibition of Trps1 downregulated its expression (Figure 4). These findings suggested that Trps1 did not reduce the extent of AKI but could significantly promote renal repair after moderate or severe I/R. Trps1 accelerated renal repair after I/R injury. The rat renal I/R injury model was established by clamping the bilateral renal arteries for 45 minutes (moderate I/R) or 60 minutes (severe I/R) followed by reperfusion. In the moderate I/R model on day 3 after I/R injury, (A) periodic acid–Schiff (PAS) staining (upper row), immunohistochemical analysis for Trps1 expression (lower row), (B) acute renal injury scores, and (C) GFR level of rats in the control and Trps1 knockdown groups are shown. (D) In the severe I/R model on day 7 after I/R injury, PAS staining (upper row) and immunohistochemical analysis for Trps1 expression (lower row) in renal tissues were performed in the control vector and Trps1 overexpression groups at different time points after I/R injury; (E) the acute renal injury scores and (F) GFR levels of the rats were measured. (G) Histology of the fibrotic outcomes of the AKI models (Masson trichrome staining showing fibrosis with blue color). Data are expressed as the means±SD for each group of rats (n=6 per group at each time point). *P<0.05 versus control. Trps1 upregulates the expression of AQP1. (A) Immunohistochemical analyses of the renal cortex were performed with antibody against AQP1 at 0 and 3 days after moderate I/R. 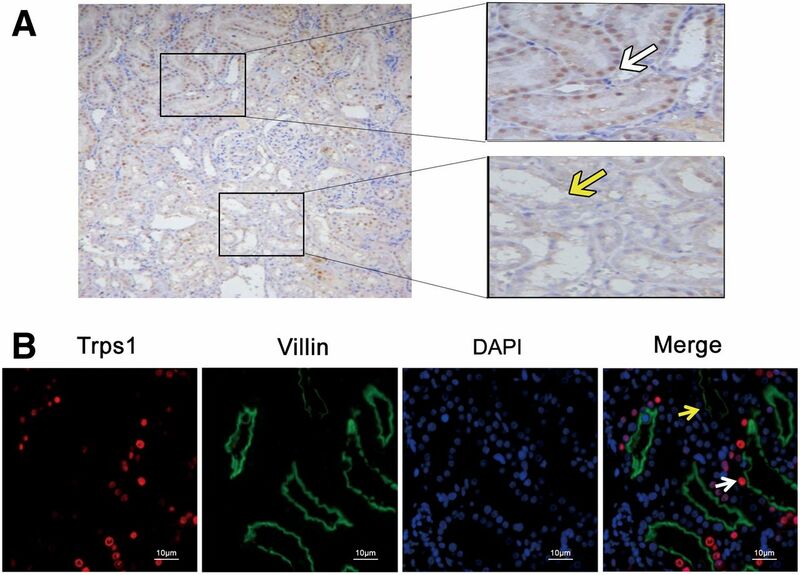 (B) Immunohistochemical analyses of the renal cortex were performed with antibody against AQP1 at 0 and 7 days after severe I/R. To examine the relationship between Trps1 expression and tubular cell growth, we first analyzed the change in the number of Idu-positive cells in the kidney after I/R. In the moderate I/R rats, the number of Idu-positive cells slightly increased on the first day after I/R, and it reached the peak on day 7. However, the proportion of Idu-positive cells was significantly reduced in the Trps1 siRNA group compared with the control (P<0.001) (Figure 5, A and B). In contrast, in the severe I/R rats, the proportion of Idu-positive cells slightly increased until day 7 after I/R, and Trps1 overexpression significantly induced a higher proportion of Idu-positive cells compared with the control (P<0.001) (Figure 5, C and D). In addition, in vitro experiments showed that PCNA, a marker that reflects the proliferation of renal tubular epithelial cells, reached its peak expression at 24 hours after hypoxia-reoxygenation (H/R) (Figure 6, A–D). PCNA expression was enhanced when Trps1 was overexpressed, whereas it was significantly reduced when Trps1 expression was inhibited at 24 hours after H/R, suggesting that Trps1 promotes the proliferation of renal tubular epithelial cells in the process of renal repair (Figure 6, E–H). Trps1 promotes the proliferation of renal cells after I/R injury. The rat renal I/R injury model was established by clamping the bilateral renal arteries for 45 minutes (moderate I/R) or 60 minutes (severe I/R) followed by reperfusion. IdU- (green) and Trps1-positive (red) cells were detected by immunofluorescence analysis of the renal tissues. (A) In the moderate I/R model, Trps1 knockdown kidneys showed a lower proportion of IdU-positive cells compared with their controls, and (B) the proportion of IdU-positive cells at 3 days after I/R was graphed. (C) In the severe I/R model, Trps1 overexpression kidneys showed a higher proportion of IdU-positive cells compared with the controls, and (D) the proportion of IdU-positive cells at 7 days after I/R was graphed. Data are expressed as the means±SD for each group of rats (n=6 per group at each time point). *P<0.05 versus control. Trps1 promotes the proliferation of renal tubular epithelial cells after H/R. Renal tubular epithelial cells (NRK-52E) were subjected to hypoxic conditions for 4 hours followed by reoxygenation (H/R model). (A) After H/R, the PCNA and trps1 levels of NRK-52E cells were detected by Western blotting, and (B and C) the relative levels to β-actin were quantified (*P<0.05 versus control). (D) The immunohistochemical analyses for Trps1 and PCNA coexpression in NRK-52E cells were performed at 6 and 24 hours after H/R injury. (E) The PCNA protein levels were increased in Trps1-overexpressed NRK-52E cells at 24 hours after H/R, and (F) its relative levels to β-actin were quantified. (G) The PCNA protein levels were reduced in Trps1 knockdown NRK-52E cells at 24 hours after H/R, and (H) its relative levels to β-actin were quantified (*P<0.05 versus 0h). Trps1 is a member of the GATA transcription factor family, and it regulates its downstream target genes by binding WGATAR (W = A/T and R = A/G) sequences. To clarify the molecular mechanisms of Trps1 that regulate renal tubular epithelial cell proliferation, ChIP-seq assays were performed. Using MACS software, we identified 401 enriched loci harboring Trps1 binding peaks that increased Trps1 enrichment in 3 days after moderate I/R relative to controls. Of these genes, 27 differential genes were associated with cell proliferation, among which four genes (Cdc42, Pde4d, Gucy2c, and Hipk2) reflected the proliferation of epithelial cells. In this study, the expression levels of Gucy2c and Pde4d were measured using the quantitative PCR. The results showed that Pde4d mRNA expression in the Trps1 siRNA group was decreased by 63% in renal tissues on day 3 after I/R compared with the control siRNA group (P<0.05). However, there were no significant differences in the expression of Gucy2c between the Trps1 siRNA group and the control siRNA group at any of the time points after I/R (P>0.05) (Figure 7A). The Western blot results showed that the protein levels of Pde4d and its downstream effector molecule pAKT were decreased in the Trps1 siRNA group by 52%–68% compared with the control (P<0.05) (Figure 7B). Trps1 siRNA could inhibit the expressions of pAKT and Pde4d in renal tissue (Figure 7, C–F). Immunofluorescence analysis showed that Pde4d and pAKT were coexpressed in renal tubular epithelial cells on day 3 after I/R injury (Figure 7G). Using a dual fluorescence reporter gene system, we found that, in the H/R model of NRK-52E cells, the Pde4d promoter luciferase activity was increased by 246% when Trps1 was overexpressed (P<0.05), and its luciferase activity was decreased by 73% when Trps1 was silenced (P<0.05) (Figure 8). Trps 1 regulates the expression of Pde4d and Akt, but not Gucy2c, after I/R injury. The mRNA levels of (A) Pde4d and (B) Gucy2c in renal tissues after moderate I/R injury were detected by quantitative PCR. Data are expressed as means±SD (n=6 per group at each time point). (C) The expression of Pde4d, Akt, and pAkt in renal tissues in the Trps1 siRNA and control siRNA groups was detected by Western blotting, and (D–F) the relative levels to β-actin were quantified. Data are expressed as means±SD (n=6 per group at each time point). *P<0.05 versus control. (G) In the moderate I/R model, immunohistochemical analyses for Pde4d and pAkt expression in renal tissues were performed at 3 days after I/R injury. Trps1 mediates H/R-induced activation of the Pde4d promoter. The psiCHECKTM-2 dual luciferase reporter plasmids were used, and the Pde4d 3′-UTR promoter fragment was cloned to produce psiCHECK-Pde4d. NRK-52E cells were cultured to approximately 80% confluence in a 24-well plate and then, cotransfected with psiCHECK-Pde4d and Trps1 overexpression vector (or Trps1-siRNA) for 48 hours. The cells were cultured under hypoxic conditions (1% O2, 94% N2, and 5% CO2) in FBS- and antibiotic-free medium for 4 hours at 37°C to induce hypoxic injury; then, they were returned to 5% CO2 and 95% air for reoxygenation for 24 hours (H/R). Luciferase activities in the cells were determined by the dual luciferase assay kit. Data are expressed as means±SD (n=6). *P<0.05 versus psiCHECK-Pde4d; #P<0.05 versus psiCHECK-Pde4d. We further observed the role of Pde4d in the proliferation of renal tubular epithelial cells after H/R injury. The level of PCNA was significantly increased in Trps1–overexpressed NRK-52E cells at 24 hours after H/R compared with Trps1 normal cells. Moreover, the level of PCNA was decreased by 73%–82% after transfection with Pde4d siRNA or treatment with the PI3K inhibitor wortmannin (Figure 9, A and B). Compared with wild-type rats, Trps1 overexpression resulted in a significant upregulation of PCNA level on days 1, 3, and 7 after I/R. Pde4d–specific inhibitor GEBR-7b decreased the proportion of the PCNA protein level by 63%–78% at different time points (Figure 9, C and D). These data suggested that the proliferative effect of Trps1 in renal tubular epithelial cells was mediated by the Pde4d/PI3K/AKT signaling pathway. Trps1 promotes the proliferation of rat renal tubule cells, which is mediated by the Pde4d/PI3K/AKT signaling pathway. 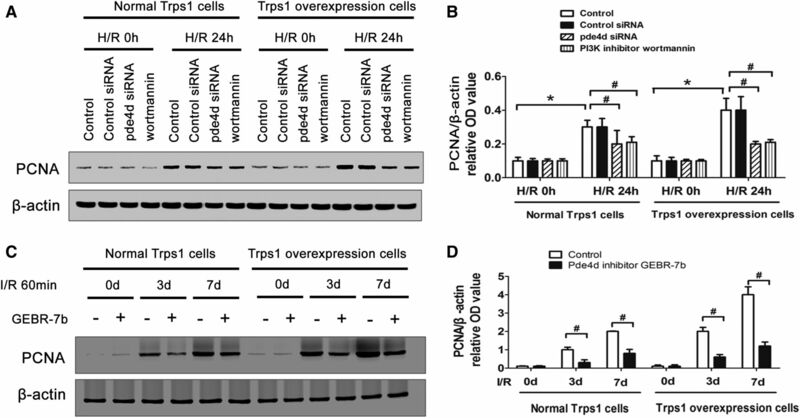 (A) The PCNA levels were detected by Western blotting, and (B) the relative levels to β-actin were quantified in Trps1 normal and Trps1 overexpression NRK-52E cells at 0 and 24 hours after H/R. Transfer with Pde4d siRNA and the PI3K inhibitor wortmannin resulted in a decreased proportion of the PCNA protein level. Data are expressed as means±SD (n=6). *P<0.05 versus the counterpart at 0 hours after H/R; #P<0.05 versus control at 24 hours after H/R. (C) The PCNA levels were detected by Western blotting, and (D) the relative levels to β-actin were quantified in the rat I/R model with Trps1 overexpression. Pde4d-specific inhibitor resulted in a decreased proportion of the PCNA protein level. Data are expressed as means±SD (n=6). #P<0.05 versus DMSO. This study showed, for the first time, that Trps1 expression is positively associated with the extent of renal repair after I/R injury. Trps1 overexpression accelerated the repair of damaged renal tissues and the proliferation of renal tubular epithelial cells, whereas inhibition of Trps1 expression delayed renal repair from I/R injury. Additional studies revealed that the Trps1/Pde4d/PI3K/AKT signaling pathway, as the underlying mechanism, was involved in the proliferation of damaged renal tubular epithelial cells. When AKI occurs, tubular epithelial cells experience a complex pathophysiologic process of renal repair that is considered as a reoccurrence of embryonic kidney development, including proliferation, migration, and redifferentiation.9,21 It has been reported that Trps1 plays an important role in regulating the development of various organs, including the lungs, gut, kidneys, joints of limbs, maxilla, mandible snout, and hair follicles.4,13,14 In addition, Trps1 has been shown to be a master gene that regulates the differentiation and maturation of embryonic tubular epithelial cells.12 Moreover, Gai et al.10 have found that Trps1 haploinsufficiency enhances TGF-β1–induced epithelial to mesenchymal transition and tubulointerstitial fibrosis by modulating Smad7 degradation. In our study, Trps1 was found to have a protective effect on the kidney in both the moderate and severe I/R injury models. Interestingly, overexpression of Trps1 accelerated renal repair after I/R, whereas inhibition of Trps1 remarkably delayed the repair of the damaged kidney. These results also were confirmed by histologic findings, suggesting that Trps1 promoted renal recovery from AKI but could not reduce the degree of renal I/R injury. Re-entry into the cell cycle to acquire the ability to proliferate is the most critical pathophysiologic step during the repair process for tubular epithelial cells after AKI.22–24 Trps1 is involved in the development of various organs16,18,25,26 and tumor progression11 by regulating crucial components of signaling pathways that control cell proliferation and apoptosis. Fantauzzo et al.18 have found that Trps1 regulates the proliferation of the follicle epithelium by its direct control of Sox9, a hair follicle stem cell regulator. Another study has shown that Trps1 represses the transcription of PTHrP by directly binding to its promoter, leading to an expanded proliferative zone in Trps1−/− epiphyseal growth plates.27 Similarly, Trps1 may promote cancer cell proliferation. A study by Wu et al.17 has shown that Trps1 modulates cell proliferation and controls cell cycle progression during cancer development. Moreover, silencing Trps1 leads to changes of key cell cycle–related genes that are involved in regulating the G2 phase and the G2/M transition of the cell cycle. G2/M arrest in tubular epithelial cells after injury results in the production of profibrogenic growth factors.28 In addition, Trps1 maintains cell proliferation and counteracts apoptosis in the normal kidney,11 and Trps1–deficient developing kidneys exhibit low levels of cell proliferation and enhanced apoptosis.29 In this study, we found that Trps1 promoted the proliferation of tubular epithelial cells in both in vivo and in vitro experiments. Trps1 is a member of the GATA transcription factor family. It contains only one C4–type zinc finger and is considered to function as a transcription repressor, unlike the other family members that function as transcriptional activators.30 Trps1 binds to the consensus GATA sequences in the promoter regions of target genes by its C4–type zinc finger and suppresses transcription via protein-protein interactions.11 Interestingly, Trps1 has been recently reported to function as a transcriptional activator, because it binds to the promoters of several Wnt inhibitors, such as Wif1, Apcdd1, and Dkk4, to activate their transcription.12 To further investigate the underlying mechanism by which Trps1 promotes the proliferation of renal tubular epithelial cells, a ChIP-seq assay was performed to screen the downstream genes of Trsp1 at 3 days after I/R. The results showed that Trps1 increased the mRNA and protein levels of Pde4d during the renal repair process after I/R injury. Pde4d plays an important role in the proliferation of tumor cells, and it has become a potential target for inhibiting the growth of tumor cells.31–34 However, the exact role of Pde4d is unclear in the kidney. In this study, the Trps1 did not promote the proliferation of renal tubular epithelial cells, although it maintained a high level in those cells under normal condition. After I/R injury, intervention of Trps1 expression significantly affects the proliferation of renal tubular epithelial cells. Furthermore, we found that only Trps1/vimentin double–positive cells underwent proliferation (Supplemental Figure 3A), suggesting that the proliferative effect of Trps1 was dependent on a specific cell phenotype. Similarly, the upregulated pde4d expression was found only in vimentin-positive cells (Supplemental Figure 3B). Therefore, Trps1, even at a relatively low level, stimulates pde4d-mediated proliferation of tubular epithelial cells after moderate I/R injury when renal tubular epithelial cells undergo epithelial to mesenchymal transition to acquire a mesenchymal phenotype. Recent studies have revealed that Pde4d can promote nasopharyngeal carcinoma proliferation through the PI3K/AKT signaling pathway.35 In fact, activation of the PI3K/AKT signaling pathway plays a crucial role in the proliferation of renal tubular epithelial cells after I/R injury.36,37 In this study, Trps1 siRNA significantly downregulated Pde4d and its downstream signaling molecules PI3K/AKT, whereas Pde4d silencing by siRNA, pde4d-specific inhibitor, or PI3K inhibitor wortmannin significantly antagonized the proliferative effect of Trps1 in renal tubular epithelial cells. Gai et al.12 found that BMP-7 directly regulated the expression of Trps1 in embryonic kidney tissues. BMP-7 has been suggested to facilitate repair of acutely injured kidney, mainly through promoting proliferation and inhibiting apoptosis and transdifferentiation of renal tubular epithelial cells. Recent studies have also found that BMP-7 can promote the proliferation of renal tubular epithelial cells during AKI,38 although the mechanism is unclear. In this study, Trps1 promotes the proliferation of renal tubular epithelial cells through the PI3K/AKT signaling pathway, which are important downstream of BMP-7,39 suggesting a Trps1–mediated proliferative effect of BMP-7. Taken together, these results suggest that the Trps1/Pde4d/PI3K/AKT signaling pathway plays an important regulatory role in the proliferation of renal tubular epithelial cells after I/R injury. In conclusion, this study is the first to provide evidence that Trps1 upregulates the level of Pde4d by directly binding its promoter region GATA sites, thereby contributing to the proliferation of renal tubular epithelial cells. The Trps1/Pde4d/PI3K/AKT signaling pathway is involved in the repair of the kidney after I/R injury, thus providing a potential therapeutic target for the treatment of AKI. Male Sprague–Dawley rats at 4–5 weeks of age and weighing 150–200 g were obtained from the Laboratory Animal Center of the Third Military Medical University. The experimental protocols were approved by the Institutional Animal Care and Use Committee of the Third Military Medical University. Rat renal tubule epithelial cells (NRK-52E) were purchased from the American Type Culture Collection (Manassas, VA). DMEM, FBS, and trypsin were purchased from HyClone Laboratories (Logan, UT). The following antibodies were used in this study: polyclonal rabbit anti–rat Trps1, polyclonal goat anti–rat AQP1, polyclonal rabbit anti–rat β-actin, polyclonal rabbit anti–rat Pde4d, monoclonal mouse anti–rat Akt, polyclonal rabbit anti–rat pAkt, monoclonal mouse anti–rat villin, and control rabbit or mouse IgG (Santa Cruz Biotechnology, Santa Cruz, CA); polyclonal rabbit anti–rat PCNA (Upstate, Billerica, MA); FITC–labeled goat anti–mouse IgG and control goal IgG (Jackson ImmunoResearch Laboratories, West Grove, PA); Cy3–labeled goat anti–rabbit IgG (Beyotime Institute of Biotechnology, Shanghai, China); and horseradish peroxidase–conjugated goat anti–rabbit or –mouse IgG (Zhongshan Goldbridge Biotechnology, Beijing, China). The anti-AQP1 antibody was an anti–rabbit IgG Cy3–conjugated antibody (Sigma-Aldrich, St. Louis, MO). pGFP-C-shLenti Trps1-siRNA vector and pLenti-C-mGFP Trps1 overexpression vector were from OriGene China (Beijing, China). The PI3K inhibitor wortmannin was purchased from Invivogen (San Diego, CA). GEBR-7b, the Pde4d-specific inhibitor, was purchased from Merck Millipore (ON, Canada). Trps1-siRNA or Trps1 overexpression vectors were mixed with Sonovue (Bracco, Milan, Italy) at a ratio of 1:1 (vol/vol) as described previously.20 For the control group, the same amount of empty control plasmids was used. The mixed solution (400 μl) was then injected via the tail vein of each rat. Immediately after injection, the ultrasound transducer (Therasonic; Electro-Medical Supplies, Wantage, United Kingdom) was directly applied onto the left kidney with the ultrasound media and a continuous wave output of 1 MHz at 1-W power output for a total of 5 minutes. GFPs were detected by immunofluorescence analysis at 1 and 14 days after transfection. The mRNA and protein levels of trps1 were measured by PCR and Western blot analysis, respectively. The I/R injury model was established 24 hours after ultrasound microbubble–mediated gene transfer to renal tissues. The rat model of renal I/R injury was established as described previously by Yokota et al.40 Briefly, rats were fasted overnight, anesthetized by an intraperitoneal injection of 3% pentobarbital sodium (0.1 ml/100 g body wt), and subjected to an abdominal incision. Their rectal temperatures were maintained at 37°C using a thermistor connected to a servo–controlled heating pad (model D1-L; Haake, Tokyo, Japan). In I/R rats, the bilateral renal arteries were dissected and clamped with nontraumatic clamps for 45 minutes to induce a moderate I/R injury or 60 minutes to induce a severe I/R injury. Renal pedicles were then reperfused in situ. Sham–operated control rats were subjected to an abdominal incision without clamping of the renal pedicles. The rats were observed on days 1, 3, 7, 14, and 21. Six rats from each group were euthanized at each time point, and their renal tissues were dissected carefully for additional analysis. In addition, blood samples were collected from individual rats for the measurement of serum creatinine concentrations. Kidney tissue sections (4 μm) were stained with periodic acid–Schiff and Masson trichrome and analyzed under an Olympus Microscope (Tokyo, Japan). At least 10 randomly selected fields from each sample were evaluated to assess the severity of renal tubule injury by at least two pathologists in a blinded manner as described previously by Sharfuddin et al.41 Briefly, tubular injury was scored by estimating the percentage of tubules in the outer medulla that showed epithelial necrosis and/or necrotic debris as follows: 0, <10%; 1, 10%; 2, 10%–25%; 3, 26%–75%; and 4, >75%. The GFRs were measured by the inulin clearance method as previously reported.42 Briefly, animals were subjected to an abdominal incision after anesthetization. Then, the animals were first primed with 1 ml solution containing inulin (300 mg/kg; Sigma-Aldrich). Subsequently, the rats were given a continuous infusion of 0.9% NaCl plus 3% mannitol containing inulin (15 mg/ml) using an infusion pump. Plasma and urine inulin concentrations were measured using a spectrophotometer within 24 hours. The GFR was calculated from inulin clearance and normalized by body weight, and the results are shown as milliliters per minute per 100 g.
The in vitro experimental model of H/R injury was established as described previously by Yang et al.43 NRK-52E cells were cultured in DMEM supplemented with 5% FBS, penicillin (100 U/ml), and streptomycin (100 μg/ml). Subsequently, cells were cultured under hypoxic conditions (1% O2, 94% N2, and 5% CO2) in FBS- and antibiotic-free medium for 4 hours at 37°C to induce hypoxic injury; then, the cells were cultured in 5% CO2 and 95% air for reoxygenation. The cells were harvested at 0, 6, 12, or 24 hours after reoxygenation. NRK-52E cells were transfected with Trps1-siRNA, Trps1 overexpression vectors, Pde4d-siRNA, or control siRNA (sc-35438; Santa Cruz Biotechnology) using jetPRIME (Polyplus Transfection) as described previously by Yang et al.44 Cells incubated with jetPRIME alone were used as the negative control. The mRNA levels of target genes were determined by quantitative real–time PCR using specific primers and premixed SYBR green reagents (Takara, Kyoto, Japan) on an ABI 7500 System (Applied Biosystems, Foster City, CA). The sequences of the primers were as follows: Trps1, forward 5′-ATGTATGCAACGCATGTGGC-3′ and reverse 5′-TAAGGCGCTTTCTTGTCCGT-3′ (117 bp); Pde4d, forward 5′-GAAAATGGCTCAGCAGACGAC-3′ and reverse 5′-TGAGCCATGGGTTTGGAACA-3′ (99 bp); Gucy2c, forward 5′-AAAAGTTCATCGCGAACGCC-3′ and reverse 5′-TCCCCTCCAGTAAGCGAGA-3′ (108 bp); and β-actin, forward 5′-CGCGAGTACAACCTTCTTGC-3′ and reverse 5′-CGTCATCCATGGCGAACTGG-3′ (70 bp). PCR amplification was performed at 94°C for 5 minutes and 40 cycles of 94°C for 30 seconds, 57°C for 30 seconds, and 72°C for 40 seconds. The relative quantity of mRNA transcripts of each gene was calculated using the 2−ΔΔCt method (where Ct is the threshold cycle), and β-actin served as the endogenous control for normalization. Cells or renal tissues of rats were lysed, and total protein was quantified using the bicinchoninic acid method. Samples (30 μg protein) were loaded onto polyacrylamide gels and subjected to SDS-PAGE, and then, they were electrotransferred onto nitrocellulose membranes followed by blockade with 3% BSA. Subsequently, membranes were incubated with anti-Trps1 (1:500), anti-PCNA (1:200), anti-Pde4d (1:200), anti-Akt1 (1:500), anti-pAkt1 (1:500), or anti–β-actin (1:2000; loading control) antibody at 4°C overnight. Membranes were washed three times, incubated with horseradish peroxidase–conjugated secondary antibodies (1:1000) at room temperature for 1 hour, and visualized using enhanced chemiluminescence. The relative levels of each protein to control β-actin were quantified using Quantity One software (Bio-Rad, Hercules, CA). The procedure of ChIP-seq was carried out as previously described.45 Renal DNA protein after moderate I/R at 3 days and controls were crosslinked with formaldehyde and sonicated to obtain 100–500 bp of chromatin fragments. Sonicated chromatin was precleared and incubated with 2 μg anti-trps1 or anti-rabbit IgG overnight at 4°C. After elution and reverse crosslinks, quantitative PCR was performed for quality control. For ChIP-seq, the precipitated DNA was repaired using PNK and Klenow enzyme and ligated to adapters according to the manufacturer’s instructions. Subsequently, PCR-amplified fragments of 100–300 bp (including adaptor sequence) were sequenced using the Solexa 1 G Genome Analyzer following the manufacturer’s protocols (Illumina; www.illumina.com). Sequencing data were mapped to the reference genome. Only the unique mapped reads were used for standard analysis and personalized bioinformatics analysis. NRK-52E cells were fixed with 4% paraformaldehyde for 30 minutes and treated with 0.25% Triton X-100 at room temperature for 10 hours. Subsequently, cells were incubated with primary antibody against Trps1 (1:300) overnight at 4°C. After being washed, cells were incubated with FITC–conjugated anti–rabbit IgG (1:20) or Cy3–conjugated anti–mouse IgG (1:50) at 37°C for 1 hour and costained with DAPI. Immunologic reactions were imaged under a confocal laser scanning biologic microscope (Olympus). IdU (MP Biomedicals, Solon, OH) solutions were made fresh as 20 mg/ml stocks in sterile 0.9% saline warmed to 45°C as described previously.46 Thymidine analogs were injected at 50 mg/kg intraperitoneally at 4 hours before euthanasia. Genomic DNA was obtained from PBMCs using the QIAamp DNA Extraction Kit (Qiagen, Germantown, MD). The Pde4d 3′-UTR promoter fragment (positions −3000 to +10) was cloned into the psiCHECKTM-2 Dual Luciferase Reporter Plasmid (catalog no. C8021; Promega, Madison, WI) to produce psiCHECK-Pde4d using the PCR method. Using rat genomic DNA as a template, PCR primers (forward 5′-GATGAGGTGGATATCAGTGTT-3′ and reverse 5′-GGCATTTTTGATAGATTATG-3′) were used to amplify the Pde4d 3′-UTR promoter fragment using the following reaction conditions: 94°C for 30 seconds, 65°C for 1 minute, and 72°C for 1.5 minutes for 30 cycles. The sequences of all constructs were verified. NRK-52E cells were cultured to approximately 80% confluence in a 24-well plate and then, cotransfected with psiCHECK-Pde4d and Trps1-siRNA (or Trps1 overexpression vector) for 48 hours. Subsequently, cells were cultured under hypoxic conditions (1% O2, 94% N2, and 5% CO2) in FBS- and antibiotic-free medium for 4 hours at 37°C to induce hypoxic injury; then, the cells were cultured in 5% CO2 and 95% air for reoxygenation. The cells were harvested at 24 hours after reoxygenation. Firefly and Renilla luciferase activities were measured using the Dual-Luciferase Reporter Assay System (catalog no. E1910; Promega), and Renilla luciferase activity was normalized to firefly luciferase activity. All assays were performed in triplicate in three independent experiments. All values are presented as means±SD. Differences among different groups were analyzed by one-way ANOVA followed by multiple pairwise comparisons by the Newman–Keuls test using SPSS 18.0 software (IBM SPSS, Chicago, IL). P values of <0.05 were considered to be statistically significant. We thank Yuan-Shen Xie, the State Key Laboratory of Kidney Disease, Kidney Center of the People’s Liberation Army, Chinese People's Liberation Army of China General Hospital, for his assistance in searching the medical literature. This work was supported by grant 2011CB944004 from the National Basic Research Program of China and National Natural Science Foundation of China grants 81370785, 81470962, and 81473531. Y.J.-R. and C.K.-H. contributed equally to this work. This article contains supplemental material online at http://jasn.asnjournals.org/lookup/suppl/doi:10.1681/ASN.2016010009/-/DCSupplemental.